What is the source energy behind telepathy? Pre-cognition? Genius creativity? What is the carrier wave on which paranormal intelligence information travels? How does one individual reliably and consistently tap into this current? Paul Lezchuk was a behavior science graduate student at the University of Chicago working on his Ph.D. and was not getting the answers to big questions from his textbooks. After participating in the Battle of the Bulge in World War Two, Lezchuk had a nagging question his years at college refused to answer: "Why must I go to war and kill my brother?" To this, his professors had no answer. But one gray haired academic advised, "If you are going to answer that question, you're going to have to start your own research project, and create your own research lab." And so he did. However, it takes lots of money to start up a brain research lab, and Lezchuk had none. But he did have a guitar, and he knew three chords and nine folk songs. So Lezchuk put on a buckskin jacket, moved to Colorado, became a folk singer, and changed his name to T.D. A. Lingo, (Theocharis Docha Anthropotis), "The Backwoodsman from Lookout Mountain." In three short years, he found himself on national television, winning large cash prizes on numerous game shows, including Groucho Marx's You Bet Your Life. From this, a big New York TV producer spotted him and eventually gave him his own folk-singing summer replacement show on NBC, with guests like Burl Ives and Woody Guthrie. When he made sufficient fortune, Lezchuk took his two grocery bags full of money, gave one to the IRS, and bought 250 acres of wilderness with the other to start up his brain lab. He kept his new name. From the years 1957 until his death in 1993, T.D.A. 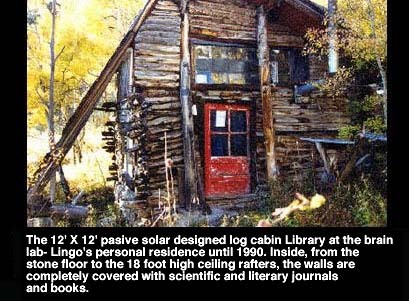 Lingo directed his independent brain and behavior research facility located in pristine Colorado wilderness, forty miles west of Denver. For 35 years he wrote a continuing set of essays and lessons about human brain function and behavior reflecting the ongoing work at his lab. Not constrained by government or academic oversight and approval, Lingo's work led him into areas beyond conventional wisdom and into realms that any conservative academic scientist would shun. Lingo's work was independent and self-sustaining, supported by individuals, and thus free of any philosophical or political restraints. The wilderness brain lab did not consist of stainless steel counter tops, microscope slides, sanitized tiled walls, and bubbling chemistry beakers. Lingo's laboratory consisted primarily of brains still in their original containers- walking, talking craniums with attached bodies. His was a living laboratory made up of real people with real life experience and problems who came to the lab to investigate their life experience and solve unanswered personal and universal questions via subjective and objective analysis and experimentation. Lingo used scientific approach, methods and procedure, along with less formal investigation. He kept voluminous records on his subjects and students, maintained a substantial library of books, periodicals and scientific journals, and did all of this within the beautiful environment of untamed mountain forest twelve months a year, utilizing a half dozen hand built cabins to keep off the rain and snow. It was Lingo's daily practice to place his typewriter on a handmade table-prop as he sat on his bed, and at his leisure write essays, reports, opinions and correspondence shortly after arising in the morning. Sometime later in the day he would go over to a hand cranked mimeograph machine, which sat in the comer of his twelve foot by twelve foot log cabin, and turn out from a dozen to a couple of hundred copies of his new paper. Some of these he would give to subjects and students at the lab for their daily lesson and discussion. Other reports would be mailed to scientific and journalistic contacts he had around the planet. The last remaining copies were filed for later use. The excerpt presented here, "Cosmic Consciousness", is but one of these essays. Although I am a professional and degreed musician by trade, in my own search for creative inspiration I sought out Lingo in 1982, became his student (and subject), and progressed to become his primary assistant in the subsequent years until his death in 1993. My own work, supported and encouraged by the director himself while he was alive, has been to apply the basic brain lab methodology to thousands of students via individual instruction, classroom application, and now, communication via the Internet and through published books. The feedback from additional students and participants after 1993 has been added to the general database. I spent countless hours discussing brain and behavior science fact, myth, philosophy, and story with Lingo, under the stars at the lab, in the city, in the library. When we cast Lingo's remaining ashes into the forest in 1993, all of his research reports and personal papers were given to me by the legal entity, The Dormant Brain Research and Development Laboratory, to continue the dissemination of his work as I saw appropriate. Thus I have further reflected on Lingo's writing, and have developed my own conclusions and opinions over the past seven years, testing, observing, and modifying technique and theory. I present this particular segment as a "Cosmic Conversations" as it were: Lingo's original text is presented here in regular type, my annotations and additional commentary is in bold type. Many of Lingo's reports and essays take scientific fact to the limit- and beyond. For T.D. Lingo, brain science went beyond dry data and the microscope. True investigation demanded the observer look at The Big Picture: Where does "wisdom" come from? How does one contact "knowledge"? What is the source of creativity and "intelligence" and how does one plug into it? [Lingo]: Cosmic Consciousness is the radio carrier wave upon which advanced problem-solving teaching/leaning information is communicated from an advanced civilization to a growing civilization. Cosmic Consciousness is distributed uniformly throughout universe with space/time/energy/matter. Once one perceives the Self within this unified reality field, infinitude of being begins. Cosmic Consciousness transmits data from brain #1 to brain #2 in zero time, regardless of distance; regardless of position of planets within the galaxy; regardless of position of galaxies within the universe. [Slade]: Descriptions of "cosmic consciousness" arise from various spiritual, religious, and mystical sources, and now more recently from the perception and experience of brain lab participants after a program of internal brain self-control. The experience is a peak emotional and intellectual understanding", a nearly indescribable feeling of contentment and unity with all existence, all other beings, and the entire universe. It is demonstrated by accurate paranormal perception: telepathy, pre-cognition, clairvoyance, clairaudience, and telekinesis. Traditionally, this experience follows intense religious practice or long periods of reflection or meditation, and may only come unpredictably after years or decades of work. In contrast, brain lab participants routinely reported this experience after from two weeks to three years of personal self-therapy and brain study. The conclusion has been that one can follow a procedure that predictably causes the experience to happen, and that it is based on self-stimulation and control of certain definable brain organs and processes. Reports of the experience suggests that each human being is situated inside an infinitely big/small field of intelligence, within a field of cosmic intelligence. Lingo states that the nature of this field is: 1) unified 2) like a radio wave 3) that information and data can he sent from one being/consciousness terminal (brain/person/animal/plant?) to another without perceptual time lag. Although radio waves seem instantaneous, they in fact travel at a certain speed within time. Apparently, the intended comparison with radio waves is not that of speed, but that cosmic consciousness, like radio waves, are transmitted via a form of non-visible energy, like electromagnetic radiation. Unlike radio waves, it is implied that cosmic consciousness travels instantly by some other mode, yet unidentified, faster than light. It may be that the cosmic consciousness field in some way reflects the origin of the universe from a singular point, and that a vestige of the singular unity remains in every atom, now separated across the expanded universe. Cosmic Consciousness may be the connection and awareness of all things, originally being a singularity: In every atom, a universal holographic memory of the rest of the universe. This being said, consciousness may be seen to exist with, yet separate from, and beyond the limitations of physical reality, time, and space. Most astrophysicists have concluded that the universe originated from one point, a singularity, in which all matter exploded from an infinitely dense single point. Originally everything in the universe was one and the same thing. What if everything in the universe is still one end the same thing? What if physical reality itself is only an illusion of consciousness? What if the only thing that actually changed- expanded - was consciousness? Scientists have looked deeper and deeper at the sub-atomic structure of atoms, electrons, and quarks, and ultimately they get down to the point where all they see is the vibration of light- no stuff- just vibration. I would suggest that the universe may not exist at all except for a conscious description of it: All is in fact connected, all exists simultaneously, all is one thing, in one place - everywhere - and at no place at the same time. The Big Bang was just an event of consciousness expansion. We are situated on a relative point in consciousness-time-space, on the imaginary landscape that we are convinced is real by our present (yet ever changing) consciousness definition. Paranormal-beyond-time/space-perception, such as accurate pre-cognition and telepathy, point to the super-reality of cosmic consciousness unity. Perception beyond space and time are possible because there imay be, in fact, no separation between events and matter, except in consciousness. [Lingo] Tuning into cosmic consciousness is not the prime goal of brain evolution. Such tuning is given to each infant at birth; merely is tuned out by neurally ignorant parents/culture; merely is re-tuned via meditation procedures within the still viable young adult. Re-tuning into cosmic consciousness merely is the pre-requisite for tuning into the "announcer" speaking required intelligence over the carrier wave; speaking specific answers to specific questions properly programmed by lesser brain #2 to greater brain #1. Proper Computer" [human brain] teaching/learning/growing causes automatic genius; evolution. For thousands of years, mystics have tuned into the carrier wave; have allowed their imperfect egos to be overwhelmed and seduced by the experience. Thus have they been blinded to the next step; dialog. Via neural cybernetics, the average student clears his/her backward child ego perfectly, transcends to egoless cosmic consciousness, and then starts dialog with his/her precisely proper cosmic teacher. Obviously, fools are not allowed into this precious survival growth/evolution network. Survival of the fittest brains. 2) The excellence of his/her received answers transformed into work for mankind and humanity; for future children. The information and answers one receives via cosmic communication with other intelligences or pure intelligence itself is dependent on the nature of the QUESTION and communication itself, and the open mindedness of the individual seeking answers from cosmic consciousness. If one looks for a simple answer, this is what will likely be received. Similarly, if one looks for a complicated cosmic dialog or no dialog at all, or refutes the transmission of communication, this "I affect or negate such transmission. This is the quantum theory of consciousness communication: Observations are shaped by the inquiry itself. To illustrate: the design and size of a radio telescope determines the kind of information that is received- but does not determine the quantity, quality, or kind of information that is available and actually exists in the universe. Mystic cosmic consciousness is the last incredibly subtle demonstration of ego imperfection. Neural cybernetic cosmic consciousness is the first routine demonstration of egoless perfection of the cosmic worker. The all perceptive cosmic worker simply enjoys the two way communication daily; outward into immediate environment to solve short/long range practical problems within his/her chosen sector of given society; inward to "Big Computer in the Sky," to "Big Daddie," when one gets stuck on an arithmetic or geometric progression of growth. What conventional culture would traditionally attribute to inner reflection, thought, and intuitive decision-making is now suggested to be affected by external intelligences- via cosmic consciousness- which transmits actual knowledge across time and space from distinctly different intelligent entities. A person aware of this fact may then deliberately make open dialog with such intelligence in any circumstance without knowing where or who the source of helpful knowledge, by merely tuning into intelligence via cosmic consciousness. The method to achieve cosmic consciousness via eastern mysticism is elitist; via Western scientism is mass multipliable into pragmatic personal ecstasy and planetary consciousness technology [i.e., "clicking the amygdala forward" and other such simple neuroscience brain self-control]. The method to achieve cosmic consciousness via this program is through the class texts; is routinely demonstrated by advanced students. The method merely requires neural retrogression into child cognitive ego, self-therapy of abused circuits, then automatic self-circuiting into frontal lobes, the nirvana experience and cosmic consciousness. The secondary rewards of automatic sleep writing, daily boring, joy, identity fulfillment, and balanced inward/outward living merely are secondary. The primary voluptuousness is the infinite ingenuity of creative production for others. A mast - therapist/teacher bestows cosmic consciousness upon any sincere student merely via creative guidance into cooperative consciousness. The Cosmic Consciousness experience can be achieved by application of relatively simple brain self-control procedures, althoug the exact methods and time spent employing these techniques seem to be highly variable. Most recently, persons have reported results in increasingly shorter periods of time, without doing the deepest self-therapy work. This could be attributed to more efficient and accurate techniques developed in recent years, or just that people are now included in the larger database who are more prone to have the experience. Whether or not these results are largely temporary, or in fact define new shortcuts to permanent changes in awareness, is yet to he seen.